GREAT SHOW, BUT WE WERE RIPPED OFFFFFFFFFFFFFFF!!! NO AWAKEN BECAUSE OF A CURFEW. YOU GOTTA BE KIDDING ME. Fabulous show as always. I've seen YES 15 times going back to 1974. Watching the five "classic" performers of a long and illustrious lineup definitely reminded me that musicianship is not dead in music. These guys still have it all going. I caught the concert August 2 at the Massachussetts' Tweeter Center,without the opening act, and this was the first time I had "doubled" up on the same tour. While they played Awaken at the earlier show, they left out Starship Trooper (my favorite song). This time around, dispite a shorter playlist, I got my wish. The opening of Firebird Suite set the tone and YES lit into a beautiful rendition of Siberian Khatru where Steve really poured his heart and soul into his play. Wakeman is the best. That's it! I hope he remains with the band for as long as they can go on. If anyone reading this hasn't picked up Magnification yet, you're missing out. The rest of the CD is great with the orchestra. Did I mention that Wakeman is the best? The others feed off of his energy. Then Howe reciprocates and then Rick takes it to a higher level. This band is still the best. But as good as Porcupine Tree was, I still regret not seeing the solos. They only accentuate the incredible skill inherent in each of the band members. I've always said that, man for man, you won't find a band where each member is a virtuoso at his craft like you find in YES. 'Nuff said. 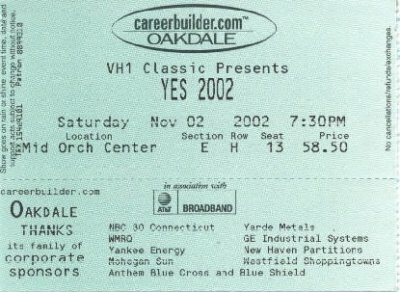 I saw Yes at the Oakdale Theater in Wallingford, CT on Novmber 2, 2002. This was my 4th time in a row seeing Yes and my 3rd time seeing them at this venue. First off, as soon as I got there I had to run a buy a new copy of the 2002 tourbook, a must for a concert memorabilia collector. It featured a lot of advertisements for Rick's solo catalogue. I was excited about seeing Porcupine Tree as well, although I was not familiar with them. When they came on stage they started to play "Blackest Eyes" off of their new album In Absentia. They just played 4 notes and I was hooked. I couldn't believe how good they sounded. They were an alternitive sounding prog metal band. Once the song had ended, vocalist/guitarist Steven Wilson said, "Hello. We are Porcupine Tree from England." That explained it. A lot of those English rock bands that most Americans have never heard of (such as Arena, Pallas, IQ, etc.) are really talented. It's too bad that they get little exposure in the U.S. and that Americans have no taste in music. Europeans have much better taste than we do. They continued to play some more songs from their new album, such as "Gravity Eyelids" and "Heartattack In A Layby." For the new songs, they were joined by a rhythm guitarist/backing vocalist who also played a little bit on the album. As soon as they were done, I ran out and bought their CD in the lobby. I was followed by a huge line a new-born Porcupine Tree fans. I was sad to see them leave the stage. I was left wanting more. Now I knew something really good was going to happen. Yes back with Rick Wakeman. This was my first time seeing them with Wakeman. He and I share the same birthday (May 18th). They came out and they were incredible. I was glad to hear such favorites such as "Siberian Khatru" and "South Side Of The Sky" return after so many years. Now I know why they haven't played these songs in a while. Only Rick Wakeman can play them. He was jumping back and forth from one keyboard to the next. It was unbelievable. I loved hearing the sound of his sacred moog synthesizer. My Rick Wakeman highlight was the moog solo at the end of "Starship Trooper." The Chris Squire bass solo was unbelievable as well. Who needs a guitar when you can play bass like that. He kept teasing us with bits and pieces from "Tempus Fugit" and "On The Silent Wings Of Freedom." I was a little dissapointed that Steve Howe did not have a solo spot this time. I was hoping to hear either the "The Clap" or "Mood For A Day." All of the guys really seemed high in spirit duirng the night, especially Rick. He was acting very friendly and shook many peoples' hands from the stage. I was surpries to hear them play "Magnification" and "In The Presence Of." I never expected to hear these songs again, now that the Yessymphonic tour is over. They pulled it off really well, with Rick playing the orchestra parts on the keyboards. I noticed that Yes is a band that tries to give you a different surprise ever year. When I first saw them in 1999, they had Billy Sherwood and Igor Khoroshev. In 2000, Billy had left but they still had Igor. In 2001, they had the unforgettable Symphony Orchestra. This year it was the triumphant return of Rick Wakeman. What will they have next year? The return of Trevor Rabin perhaps? An in-the-round tour? A 14 member version of Yes? Who knows. With this band, anything is possible. Jon Anderson stated during tonight's show that this was a "Rock & Roll Saturday Night" and Yes backed it up by entertaining the audience with a high energy, high volume performance. Steve Howe's loud guitar tone and Chris Squire's enthusiasm and swagger punctuated most of the songs. The band seems to be progressing as a cohesive unit having already heard them play at the Radio City Music Hall show in New York three months ago. I didn't hear any large mistakes at this performance unlike what I have read in reviews of other shows on this leg of the tour. Being a long time fan I'm very much appreciative to see this lineup perform live once again and hear them play such classic songs as "Close To The Edge", "Southside Of The Sky" and "Starship Trooper". Was Anderson serious when he said before "We Have Heaven" that "there are probably only three people in the audience who will remember this song"? Great show, Porcupine Tree rocked and so did Yes. No intermission, 2 straight hours of good music. The setlist flew by, there was alot of energy there that seemed to be missing from recent shows I've attended. Anderson remarked just before In The Presence Of, "I read on the Internet that I ramble alot, but I LIKE to ramble...". I saw the Radio City Music Hall show earlier this year, and the show tonight was a stellar experience. The band had cleared up some serious mix problems, and the sound was STELLAR. I agree with the post above that the set was a bit short, I was sad to not have Awaken in the set, but the highpoint was most certainly a STUNNING and almost inmpossible tight Starship Trooper. Although the set list was a bit short, the performance tonight was top notch. Squier is an absolute MONSTER. He loves what he does so dearly and his enthusiasm is as infectious as the common cold, um - the good one I mean... umm, yes. While Wakeman seemed to be having a bit of an off night, slipping a bit during Close To The Edge, he came around to BOOM during Heart of the Sunrise and Starship Trooper. Stunning experience to see the wixard in his robe making that mini-moog scream. Steve Howe was on fire this evening. He more than made up for some of Wakemans few scrapes, and I caught him looking up and grinnign quite evilly at the crows on occasion. He clearly loves this line-up and is stepping up to the plate in a way we havent heard in 20 years and more. All in all, perhaps the most POWERFUL rock show I have ever seen in my life. 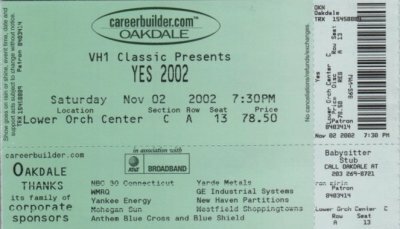 My wife and I just got back from the Yes concert at Oakdale theater. 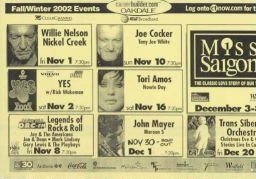 It was billed locally as "Yes with Rick Wakeman" but it should have been called "Yes with Chris Squire" as it seemed to be the Chris Squire show. He was the only one who had a solo spot tonight, with his usual "Whitefish" selection, minus the "Sound Chaser" clip. He also had his usual featured solos in "Heart Of The Sunrise" and "Starship Trooper." He was quite animated, as usual. By far the most animated of the bunch. The set was strange. They seemed to stick to the faster pieces tonight. The only real slower piece was "In The Presence Of." "Awaken" was not played. I suspect it was dropped to save Jon's voice. I know the "High Vibration" is hard for him to sing. His voice seemed to crackle a bit a few times. The performance was real strong. The band played everything well. They were in good spirits, and there were plenty of smiles all around (except from Steve). They were definately having a good time on stage. My only criticism is the set list. It was another Yessongs type set list. They need to add some lesser played pieces. Except for the _Magnification_ songs and "South Side Of The Sky" it was the same old, same old. What they played, they played exceptionally well, but they need to play some other stuff. I thought Porcupine Tree had a better stage show than Yes with their backdrops and everything.My wife absolutely loved them. They seemed more "alternative" to me than "prog". The Oakdale has wonderful acoustics. Even third row dead center, everything was crisp and clear. Usually sound isn't all that great that close. Steve seemed to have to concentrate hard to keep up. "Close To The Edge" was played briskly, faster than recent years but probably not as fast as the 70's. As Jon said, it was a real "rock and roll" set tonight. It was a fun concert, and my wife and I had a good time. It wasn't as good as the symphonic shows last year, and probably not even as good as this summer because of the setlist. This is the only show I'm hitting this leg. I think the band needs to get in the studio, record and album, and concentrate on new material for the next tour. Saturday night! Rock and roll! There�s only so much I want to say. I don�t want to get too carried away. Thank you all for coming along this evening. Here�s a song we wrote last year, and ahh, and ahh, you can try and find it in your local record store somewhere. It�s quite a nice album. This song is the idea, very simple, we are surrounded by an amazing energy, constantly. Now and again we sort of tap into it and enjoy life, for a brief moment, we feel really amazing, really good. And it�s always there, so we�ve got to practice for getting into it. It�s always there to calm and heal and make you feel good about yourself and there�s always millions of other things. And as some people say on the internet, I ramble, and I love to ramble. Oh yeah. Thank you. Wooh! Here�s a, here�s a song, here�s a song that, ahh, about three of you remember this out there. It�s a little song, it goes something like this, if you want to hear it. Thank you. Thank you so much. Thank you. It is, ahh, it really is fantastic to be able to do that piece of music and still have an audience to hear it. So, a big thank you to you. On the bass guitar, Mr. Chris Squire! Chris Squire! Chris Squire! On the drums, Mr. Alan White! On the guitar, Mr. Steve Howe! On the keyboards, Mr. Rick Wakeman! And you are the audience! Yay! I want to thank you all for coming along this evening. It�s been wonderful tonight. It�s been a rock and roll evening! We�re going to rock and roll a little bit more with �Starship Trooper�! It's been great to have you here tonight. I want to thank you all for being with us tonight..uh the big thing is you've been a great audience but can you dance? Okay. Let's go. Yeah.